Two weeks ago, a new version of LibreOffice 5 became available. On their blog the Document Foundation mentioned that apart from version 5.0.3 there has been a (final?) release in the 4.x series: 4.4.6 sources were made available as well. I will find time to compile 4.4.6 for Slackware 14.1 soon, since there are security fixes too, but there were more pressing matters to attend to, and therefore I limited myself to the new 5.x release for the moment. 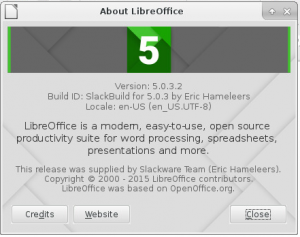 The new LibreOffice 5.0.3 packages have been compiled for users of Slackware-current only. The 4.4.5 packages that I have for Slackware 14.1 should also work on -current, but I have not tested that. I hope that this package for LibreOffice 5.0.3 survives the day… Pat is planning another (possibly intrusive) update to slackware-current which may break the package. The package was yet again compiled against gstreamer-1.x, so I would like to hear if the issues that were reported about embedded multimedia files are still there. Then there was a new release of Valve‘s steamclient. The changes are minor – adding udev support for new controllers. And anyway, your Steam run-time gets updated automatically anyway when you go online. The package is useful when installing the Slackware OS from scratch so I provide the updated package in my repository. Remember people, there is a Slackware community on Steam too! And no, I do not want to hear the moaning about a closed-source platform. Valve does more for Open Source and Linux in general than many other game companies. Posted: 20 November, 2015 in Slackware, Software. I updated the Libreoffice packages but running libreoffice complained about glibc so I thought I should update to latest slackware-current and your multilib packages. That seemed fine and rebooted + reinstalled nvidia blob which also seemed fine. After this morning -current update libreoffice packages need to be rebuild against new icu4c. 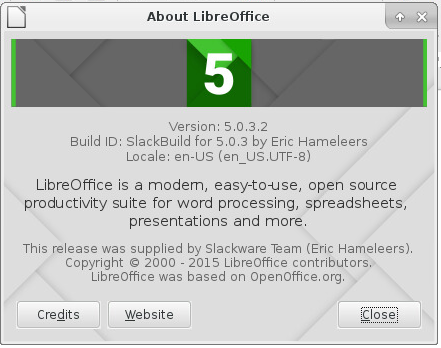 I updated the LibreOffice packages from 5.0.2 to 5.0.3 with no problems. I am running the “almost a beta” version of -current . I shied away from the latest -current. When i went to remove udev, it also offered to remove the compat-32 version of udev and I got “cold feet”. Regarding the nvidia driver, if you are using the slackbuilds package, you need to upgrade to at least version 352.63 due to a new ABI in the upgraded X package in the almost beta update. Yeah I was afraid I would have to recompile LibreOffice today… could not tell you why, yesterday. It seems that the slackware steam group is pretty inactive, last I checked. Thanks Eric and you were spot on – I had just seen the LQ thread before you responded. All sorted now – thanks! icu4c is really a calamity. So many programs to re-compile for it only. Would not it be better to uses only static libraries ? OK, i have found the Problem with Steam! A little Tip for all. Steam follow xdg and open the external Links via xdg-open. I have installed the official Chrome.deb with the Slackbuild from the Slackware64 14.1 DVD (extra/..Google-Chrome..) This create a package with the Name “google-chrome-stable” ! In /usr/bin/xdg-open exist but only a entry with the Name “google-chrome” . Steam (xdg-open) opening now a Textbrowser(links, lynx) in tty1 (yes really) and the Chaos begins. Steam cannot end, and the bash in tty1 is not available. Only a login and reboot over tty2 its possible. Ok, i hope my Info its Helpful. now, I’m in current64 with binary version of NVidia drivers. I’ve MESA installed too. Any help about this error? Fabick – the Steam package and games require multilib on a 64bit computer. After you have installed multilib, including all “compat32” packages, you need to install the 32bit version of the Nvidia proprietary drivers as well as the 64bit version. If you only installed the 64bit Nvidia drivers, then you’ve got some work to do still. @Eric thank you for the reply. I’ve done all the installation process of multilib and compat32 but, in effect, I’ve installed only the 64 bit binary package of the drivers. Now I’ve a doubt: how to install both the drivers? Can I simply download and install first the 32 bit package and after do the same with the 64 ? Or I’m going to break something in the configuration of Xorg server? The Nvidia binary driver download archive for 64bit also contains the 32bit drivers. Therefore you only need to download the x86_64 version. During installation, if the driver installer detects 32bit libraries, it should ask you if you want to install the 32bit drivers as well as the 64bit drivers. after, I downloaded the latest NVidia 64 bit binaries and after the installation process now Steam starts regularly! Thanks for all the support Eric!! … because the default libraries that come with the steam client are outdated. Let Steam upate itself and after that, simply running “steam” without the preloaded system library will start Steam without issue. Your libva-x11.so.1 error looks exactly like what happens when you start Steam for the first time – it tries to use an older libva.so.1 (which is present in the Steam runtime directory). 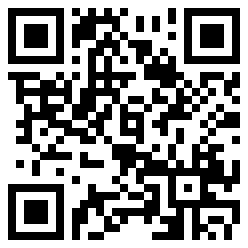 Try getting a better answer by posting your question in a new LQ article in the Slackware forum. Eric, your suggestions works very well how usual ! !